Curitiba's new Green Line uses 100% bio-diesel articulated buses. Photo via Mariana Gil. Curitiba, Brazil has long provided a global model for successful integration of transportation and land use planning, with a focus on environmental preservation. And recent innovations – including the brand new Green Line and an expanded traditional route – deserve international recognition. What’s So Cool About Curitiba? 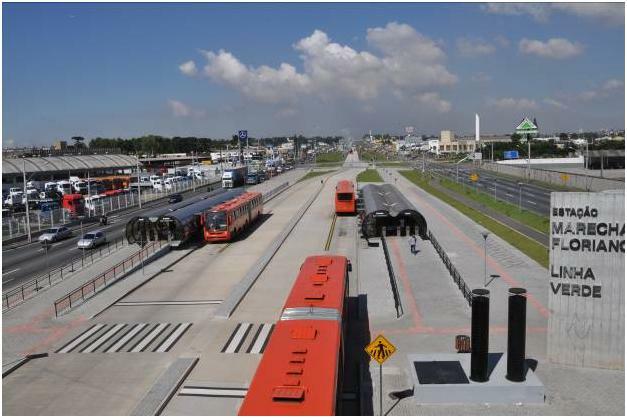 Curitiba is renowned worldwide for developing the first full bus rapid transit (BRT) system. Today, the city’s integrated transport network (RIT) reaches 14 of the 26 cities of the metropolitan area, which has a total population of 3.17 million. The RIT bus system provides the backbone for the city’s mixed use, transit-oriented development (TOD) initiative. The RIT features metro-style level access, along with electronic prepayment at terminals and “tube stations.” (There is on-board payment for feeder and inter-terminal services.) The system encourages ridership by allowing riders to pay a single flat fare for multi-modal services, including express routes and accelerated express routes, inter-neighborhood routes, feeder routes, downtown circular routes, and special services for students, hospitals, and tourists. In 2005, after a fall in ridership, the fare was cut from R$1.90 to R$1.80, and the RIT introduced a special “Sunday Fare” of just R$1.00: the RIT now serves around 2 million riders per day. 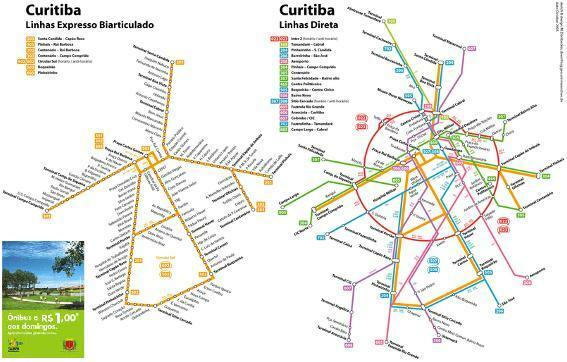 A schematic of Curitiba's Integrated Transit Network, and a poster advertising the Sunday Fare (bottom left). Image by Maximilian Dörrbecker on Wikipedia. In May 2009 the Green Line (or inter-neighborhood line) began operating, linking major terminals and outlying neighborhoods that were formerly cut off by the old federal highway BR-116, without passing through the center of the city. It is the city’s sixth BRT corridor, and i is the first to have incorporated passing lanes at stations, allowing both express and accelerated (fewer stops) BRT services. It is “green” because of its 100% bio-fuel articulated buses, its seven (to date) double tube stations that use rainwater and solar screens for climate control, and its 20,000 square-meter linear park with a new path popular among bikers, joggers, and walkers. The Green Line South (Linha Verde Sul) is the first segment of the Green Line, covering nearly 10 kilometers between the neighborhoods of Pinheirinho and Jardim Botanico. Once complete, Green Line-South will stretch 18 kilometers and connect 23 neighborhoods, increasing accessibility for 287,000 area residents and providing the backbone for a TOD urban renovation program in the zone. The Green Line currently connects the neighborhoods of Pinheirinho (66) and Jardim Botanico (07), along the old BR116 highway. Map via curitiba.info. BR-116 before becoming Green Line Corridor. Photo via Dario Hidalgo. By March 2010, the municipal government called the Green Line South the greatest urban development in the city in the past thirty years. The new corridor has ten lanes: six lanes for fast traffic, two bus-only lanes with passing capacity, and two local access lanes (the city’s innovative “trinary” road design to minimize congestion). The Green Line South forms part of the city’s TOD program, and will encourage real estate development in one of the only regions where large areas of land are still available. And the development’s already happening, as planned. Recently, when the city allowed densification in the zone – characterized by underutilized truck depot land and land used for truck-related services – real-estate prices increased by a factor of three. 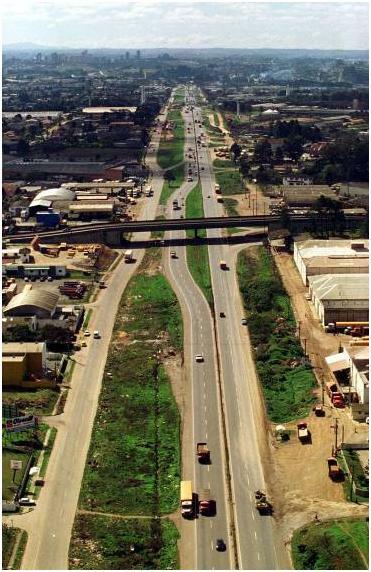 Such large underutilized tracts of land are crucial for TOD because they provide the opportunity for mixed-use development, “uniting housing and business in a single place” and providing maximum accessibility, according to Reginaldo Reinert of the Institute for Research and Urban Planning of Curitiba (IPPUC). In late May, Luciano Ducci, the Mayor of Curitiba, launched a government bid for the first phase of the Green Line North (Linha Verde Norte), which will start by linking the northern neighborhoods of Bacacheri and Bairro Alto, currently cut off from one another by highway BR-476. The Green Line - North will start by connecting Bacacheri (35) and Bairro Alto (36), which have been divided by highway BR-476. 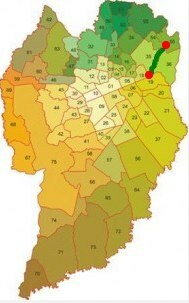 Map via curitiba.info. In March 2010, the central Boqueirão Corridor was upgraded with passing lanes at stations. Thanks to the new passing lanes the city was able to introduce new “Ligerão” (super speedy) buses, which provide express-plus service since they are not required to stop at every station. These new passing lanes increased the corridor’s capacity to 20,000 passengers per hour per direction and the average commercial speed to 25 kilometers per hour. You can count on TheCityFix to keep you up to date on innovations and best practices from this city, a constant source of great news for sustainable mobility and accessibility. So stay tuned! And to read a full report about Curitiba’s RIT and the innovations highlighted above, just click here.